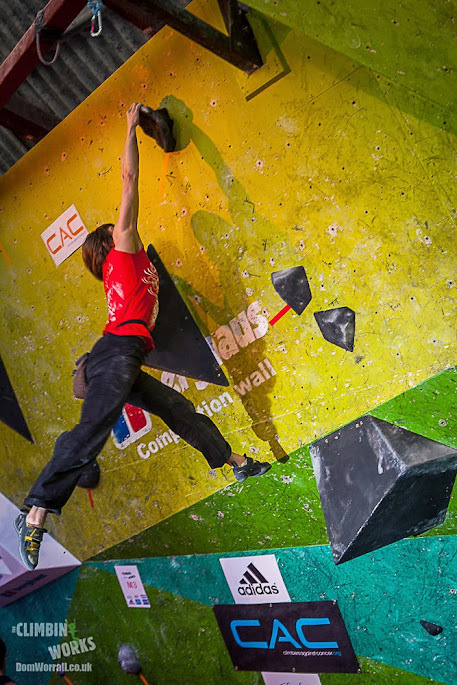 Hype surrounding The Climbing Works International Festival (CWIF) started weeks in advance with all 350 places snapped up within 2.5 days. 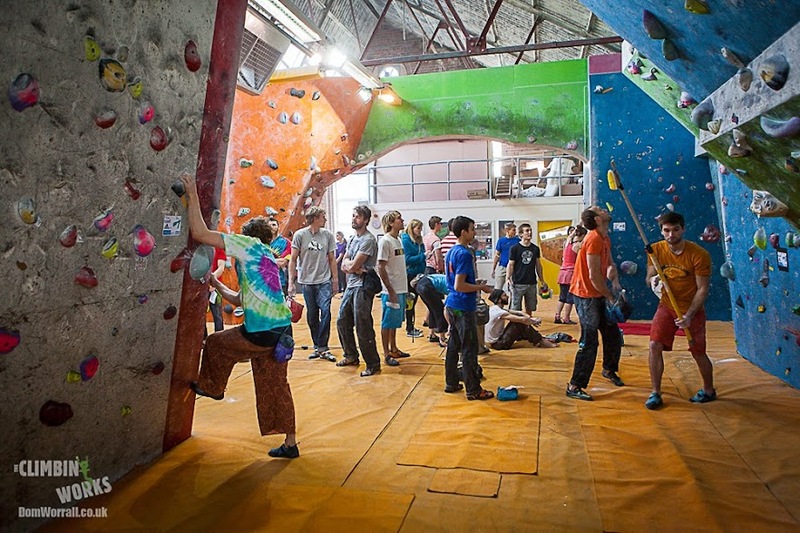 As the fabled date encroaches, the odd Facebook post or Tweet makes it into cyberspace; training schedules are tweaked for peak performance in early March; a teaser video appears online; then the climbing superstars list is revealed. 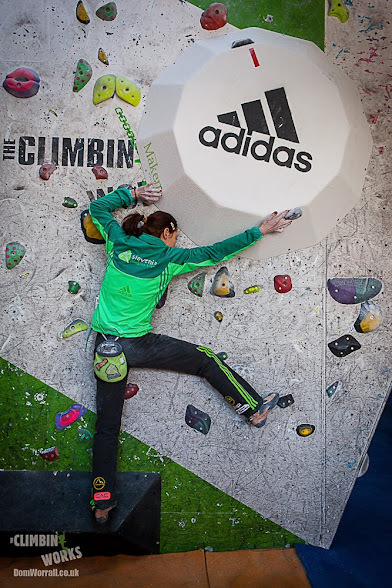 And before you know it: CWIF TIME! 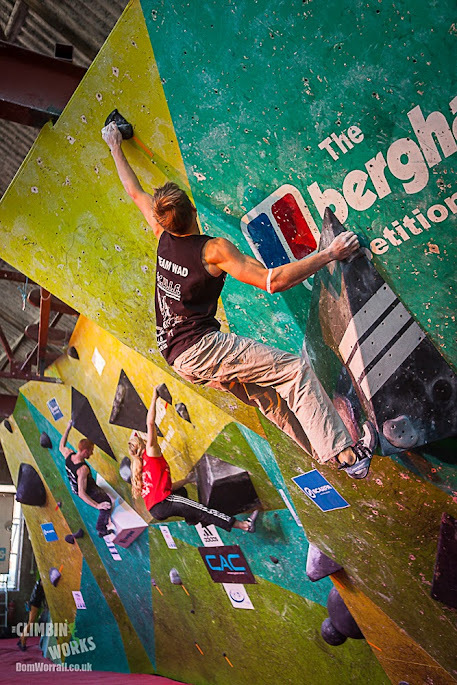 It is, arguably, the biggest UK climbing competition of the year. International climbing prodigies and seasoned veterans with guns to rival the Navarone travel from far and wide to take part. Epic prizes are up for grabs even if you don’t get past the qualifiers (raffle ticket anyone?). There are lighting rigs, film crews and photographers that would put the Oscars to shame. There’s a free BBQ! And do you ever get tired of being hit in the head by flying freebies, including t-shirts, hats and other goodies? 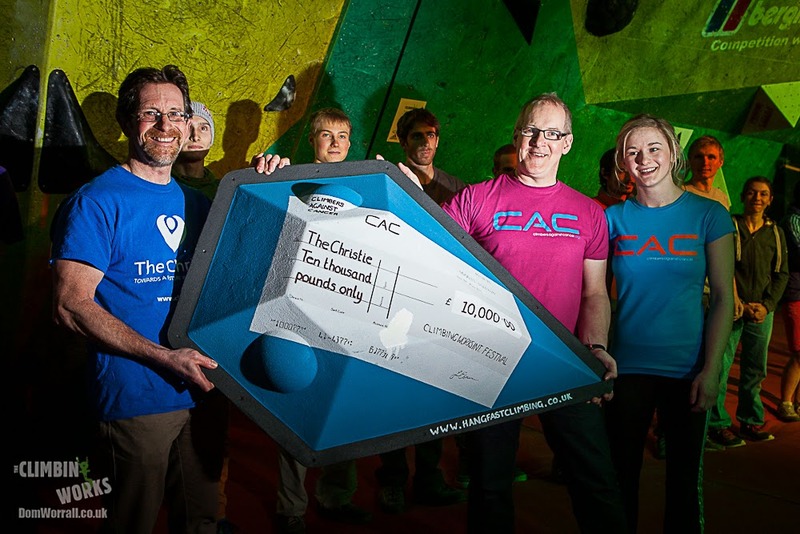 Finally, and most importantly, The CWIF always raises loads of money for good causes. 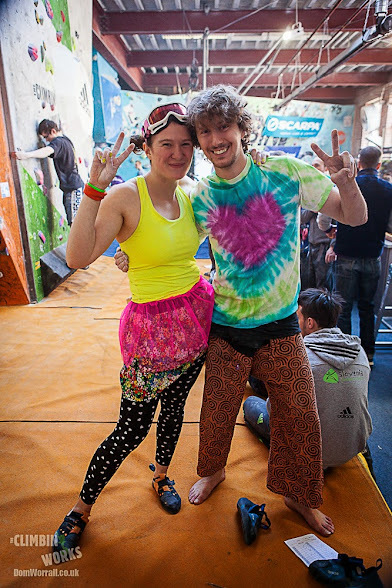 As per the last few years, The CWIF ran over two days, this year the weekend of 15th and 16th March. 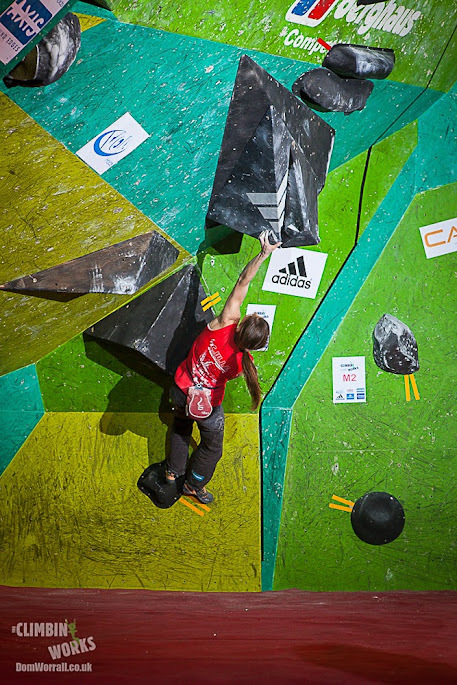 The qualifiers on day one saw 350 climbers attempt to tackle 30 boulder problems. 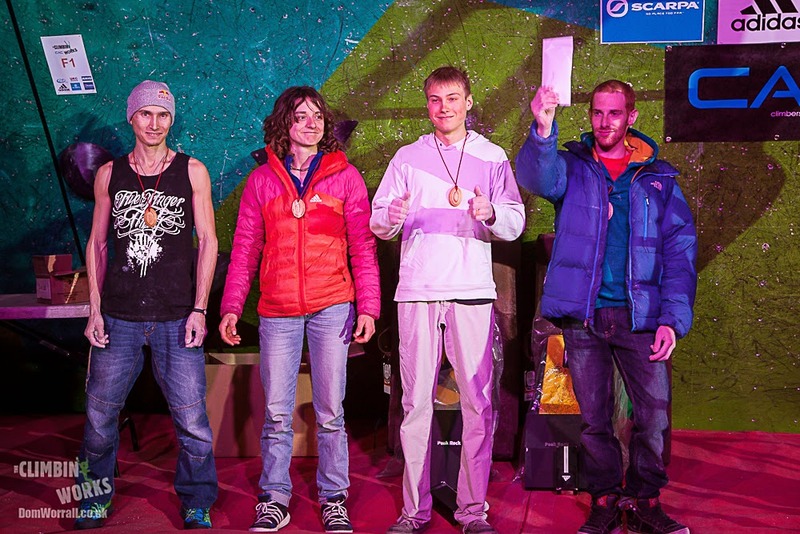 This year, there was the unprecedented CWIF occurrence of perfect scores – with both Great Britain’s Stewart Watson and Germany’s Alexander Megos climbing all 30 problems without a single fall between them. Also flying the GB flag, Shauna Coxsey came out on top in the women’s qualifiers, with 244 points. The rest of the field filed in behind, with a lot of impressive scores with the Men’s particularly tight – a score of 266 was needed to get into the top twenty. 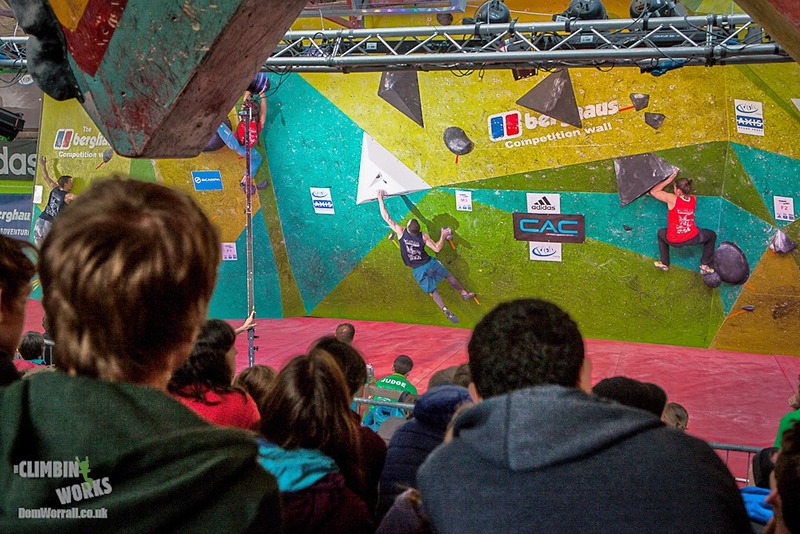 The CWIF tends to bring the best from around the UK, including most of the junior and senior team GB members, as well as local crushers fancying themselves on an international stage, as well as pulling alongside some of Europe's strongest. 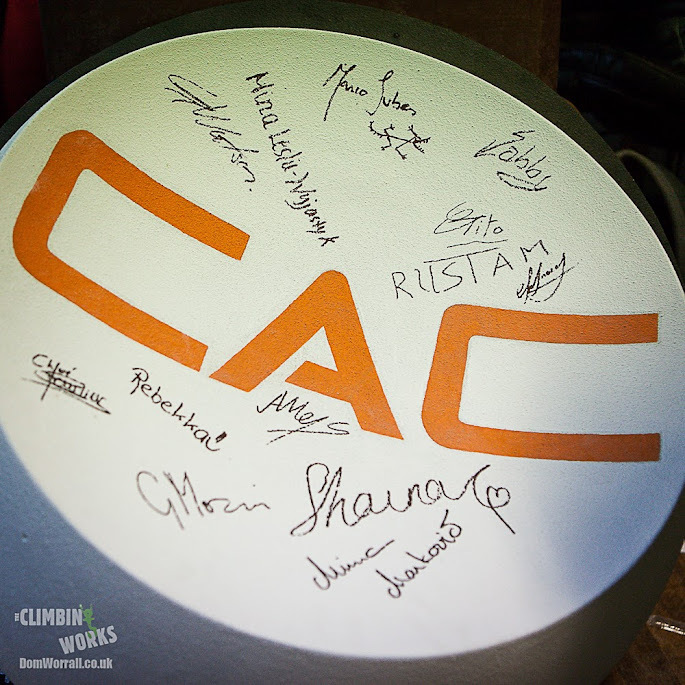 This is the simplistic beauty behind The CWIF – a chance to climb the same problems, at the same time, as the superstars. 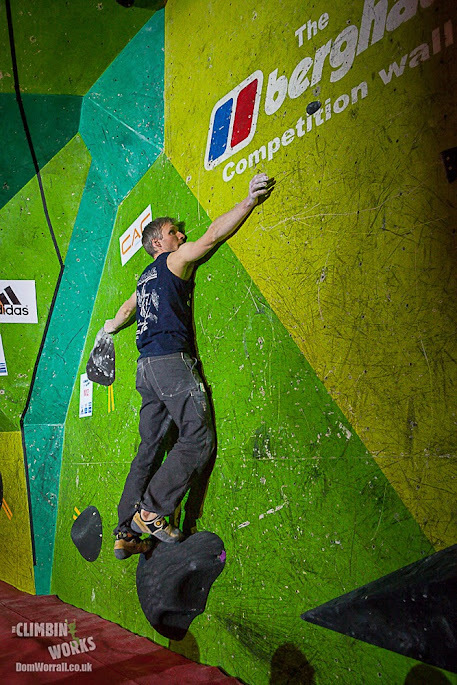 Among those facing the world cup style format in the following rounds, a number of GB athletes rose above the rest in the male category, including the aforementioned Mr Watson, followed by Nathan Phillips, Dave Barrans, Ned Feehally, James Garden, Adam Watson, Tom Newman, Climbing Works director Sam Whittaker, Jon Patridge, Matt Cousins and Joe Wilson. The women’s field also showed a strong British contingent, with Ms Coxsey leading the way. She was joined by Tara Hayes, Mina Leslie-Wujastyk, Dianne Merrick, Michaela Tracy, Alisha Garside, Molly Thompson-Smith and Jennifer Wood. Leah Crane also made semis but pulled out due to injury. Competitors rushing to complete all 30 blocs in the 3.5hr time period. Set to start at 12noon, the crowd began assembling early, knowing the rarefied honour of a good view of the show, let alone a seat. Hundreds squeezed in front of the Work’s world cup standard competition wall, with thousands more watching virtually, thanks to the wonders of web-casting. And what a thrilling show it turned out to be, only outdone by the finals (but we’ll come to that). In the women’s semis, Austrian Sabine Bacher took top spot, managing four tops in six tries. The only other to get four tops, Shauna Coxsey fell just once more to come through in second, followed by Belgium’s Chloe Caulier, the two Minas, Slovenia’s Markovic and Britain’s Leslie-Wujastyk, and Switzerland’s Rebekka Stotz. They would make up the six finalists. 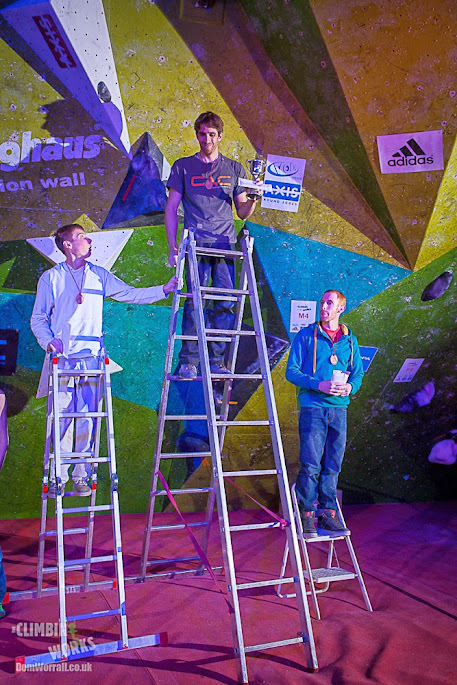 A strong men’s field saw the leading five topping out all four problems in the semi-finals, with Russia’s Rustam Gelmanov followed by German young gun Alexander Megos, CWIF veteran Tito Caleyron from France, Italy’s Gabriele Moroni, Spain’s Marco Antonio Jubes Angarita, and Great Britain’s ‘Mr Perfect Qualifying Score’ Stewart Watson bringing up the rear with three tops. The stage was now set for the finals – the field of 40 whittled down to just 12. 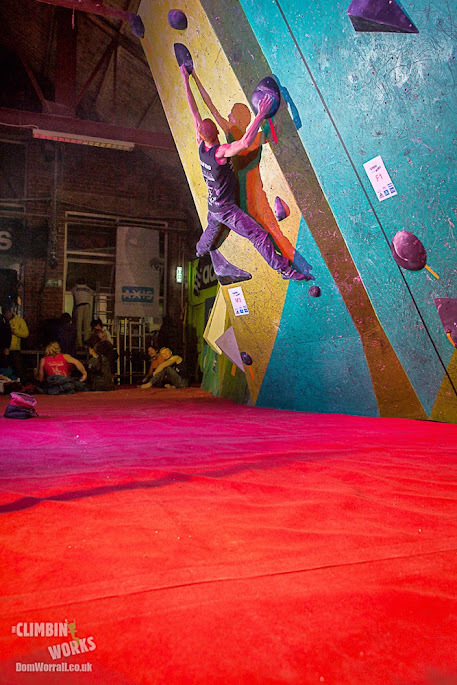 Both competitors and crowd had a few hours to unwind, enjoy the free BBQ, the sunshine gracing Sheffield, a beer or two (not for the climbers, obviously), and maybe even a climb on the unoccupied walls of The Climbing Works and Mini-Works. But it wasn’t long before the assembled masses were gathering once again, the free grub and booze keeping them occupied for only so long – they wanted a spectacle. They had got their gambling thrill, purchasing their share of raffle tickets, and were now seeking another adrenaline rush. Like the crowds of the coliseum, they wanted a battle. While there was no wielding of swords and shields on the sands of the Roman amphitheatre, the guns were brought to bear on the crash mats of the Works. The lights glared, the techno pounded, the cameras flashed and the microphones kicked into life. Out came the climbers, paraded for all to see, before the observation period began. They were then ushered into isolation and two by two they returned, hands chalked, ready to climb. 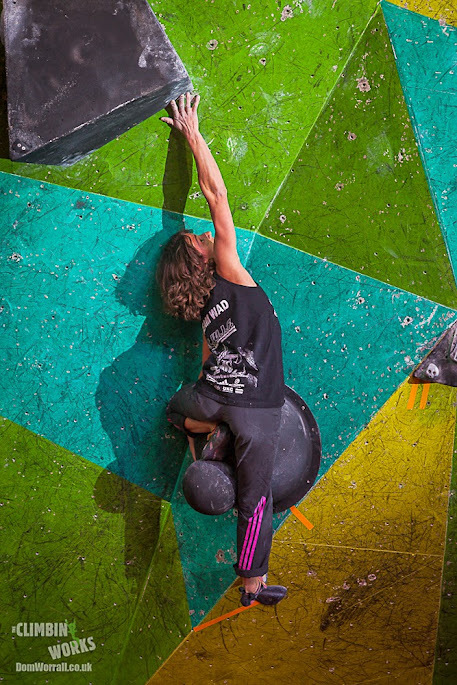 The first problem for the women involved a dyno, so there were a few false starts while the competitors sorted out their aim, except for Mina Markovic (who will be Mina M for the remainder of this report) who flashed. 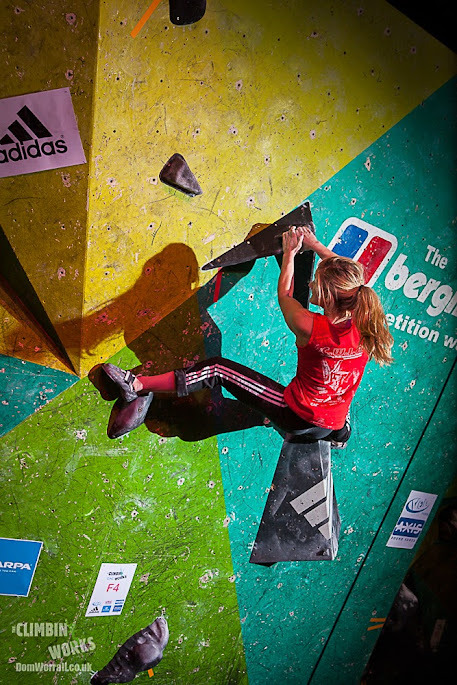 Both Shauna and Chloe took two goes to catch the dyno before climbing to the top, followed by Sabine with five tries. Mina LW and Rebekka failed to top. 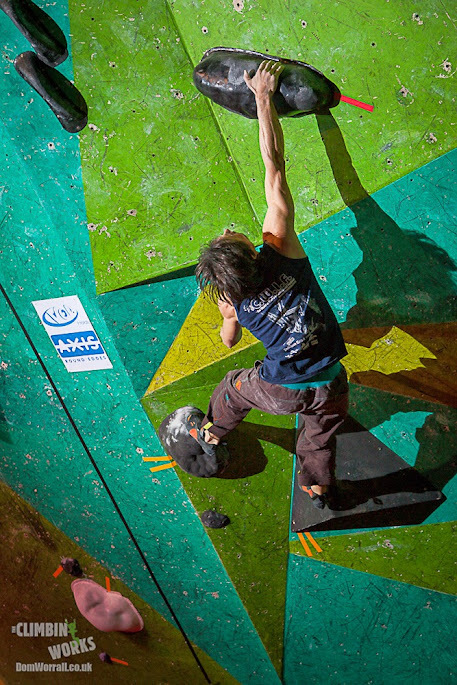 For the men, burly pulling through undercuts and crimps lead to a hold nicknamed “slippery Jim” by the commentators. Tito used every inch of his height and every ounce of his considerable power to flash the problem, while on the other end of the spectrum Alex found every knee-bar going, eventually finding the top in seven tries. No one else managed to send, many hitting the last hold before tumbling to the floor. Into round two, and this time both the women and the men faced techy slab climbs. The difference between success and failure was marginal; bring your best balancing act or go home. 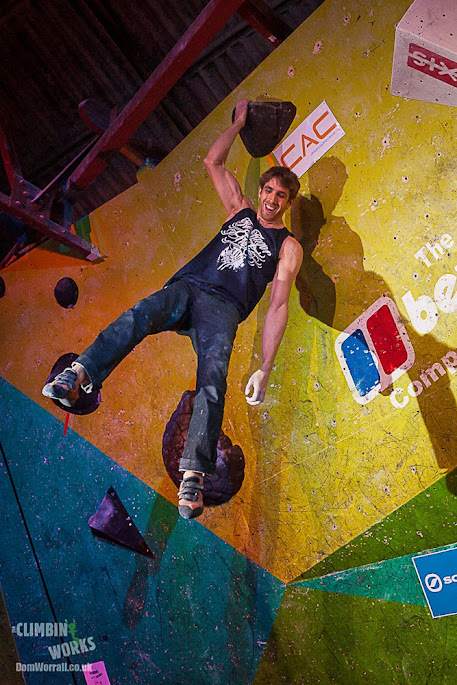 All the men teetered their way to the end, except for Rustam (an experienced World-Cup competitor) who thought he’d run out of time and dropped off at the second to last hold, apparently unaware he could continue as long as he was on the wall. The women’s problem was a horrifically slabby affair with some very small holds for hands and practically nothing for the feet. This problem saw a much more mixed set of results, with three tops in two tries from Shauna and both Minas, while Chloe, Rebekka and Sabine all failed to reach the end. Getting back to the steepness, problem three saw the women fighting their way through an enormous number of volumes, handily decorated in crimps. Rebekka was the only one to discover you could skip the first two moves and save some energy for the remainder of the climb, reaching the top in three goes. However, it turned out you didn’t need the extra juice in the tank, as Shauna and the two Minas all flashed problem three. Neither Chloe nor Sabine found the illusive sequence and couldn’t reach the end. The men, meanwhile, showed off their ranging wing-spans with a huge stretch to match a sloper while keeping their toe hooked behind the starting jug. Tito once again flashed the problem, putting him in the driving seat going into the final round, while Alex was hot on his heels with a third go send. Gabriele also managed to finish the problem, while the rest couldn’t make it work, Rustam struggling with the reach and having to find his own (unsuccessful) sequence. Going into the final round, Tito had it all to lose. Only Alex had an outside chance of winning, and that would require Tito’s failure on problem four which, based on his earlier performances, was a lot to wish for. Suffice it to say, Tito squeezed water out of the holds and powered through to victory, finishing with a perfect four flashes. Alex came through in second with a second go send, while Gabriele came in third. Rustam gained a consolation second go send of problem four to gain fourth place, followed by Stewart in fifth and Marco in sixth. The women’s final was a much closer race, with both Shauna and Mina M having completed all three previous problems, Mina ahead by only a single try. 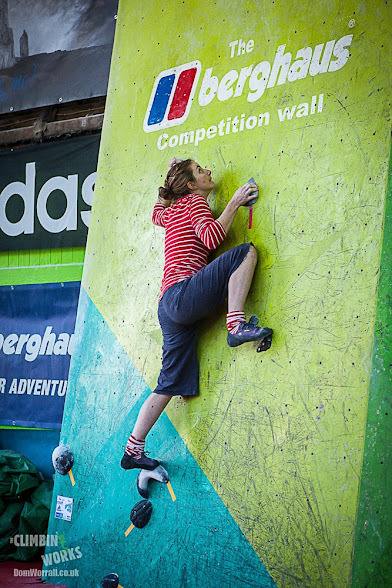 The Slovenian climbed first, powering her way through the steep wall in four tries. Shauna only needed to climb the problem in three tries or less and victory would be hers. The crowd held their breath, having already watched Mina LW, Chloe and Rebekka struggle to get through the start. However, Shauna kept her cool while others were losing theirs. 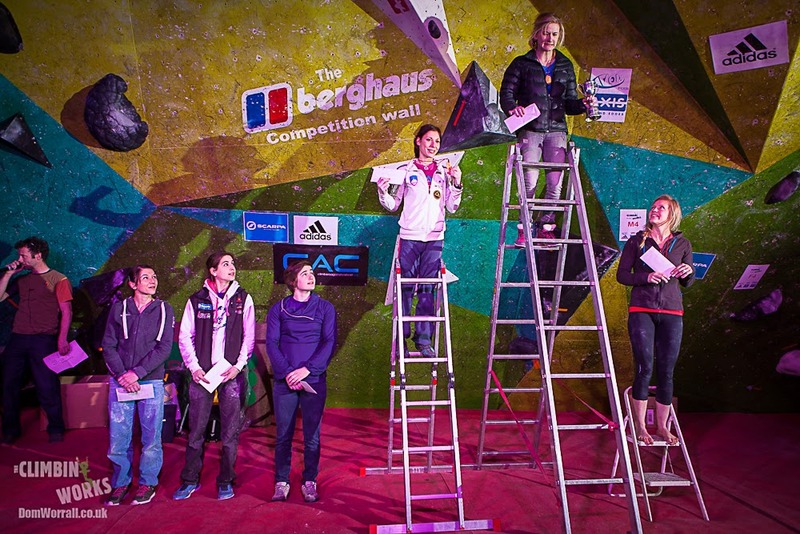 She cruised her way to the top and retained her CWIF crown for another year. 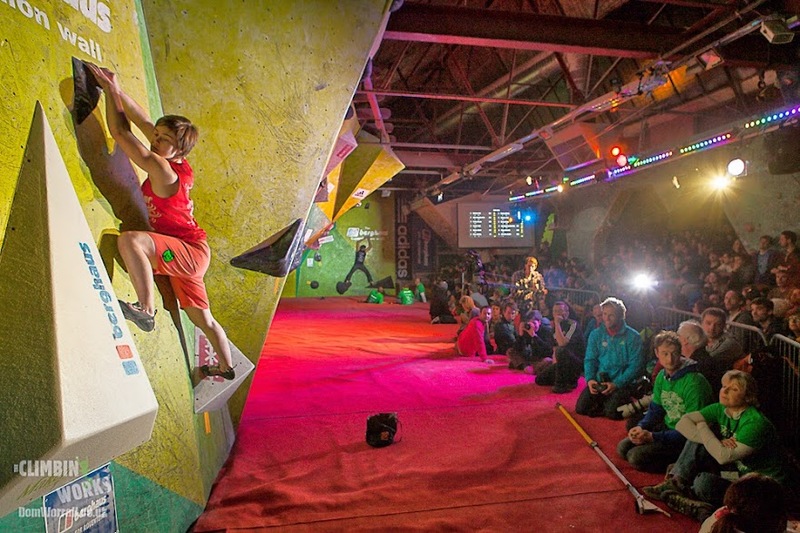 The CWIF 2014 came to a close in a hail of loud music and flashing lights. This year’s event helped raise thousands of pounds for Climbers Against Cancer (CAC) and The British Heart Foundation (in memory of Ian Vincent). The inimitable CAC mastermind John Ellison was in attendance once again, presenting a cheque for £10,000 to The Christie Charity. And that, as they say, was that. See you in 2015. 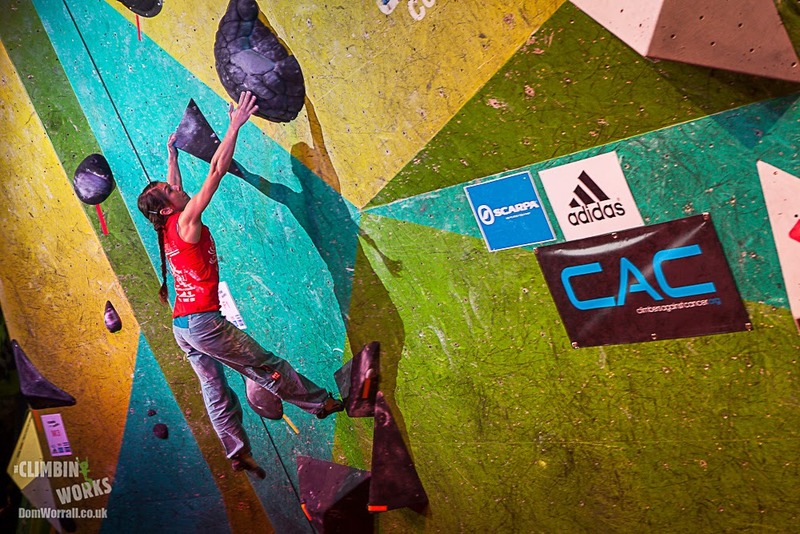 You can watch the Finals of The CWIF 2014 on replay, in HD, below. 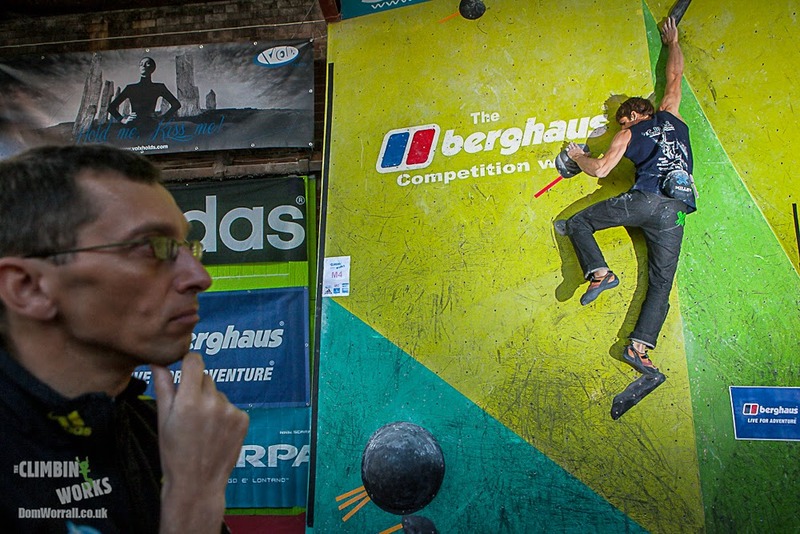 The CWIF 2014 is supported by Scarpa, Adidas, Berghaus, Axis holds & Volx holds. Official media partner is UKClimbing.com. 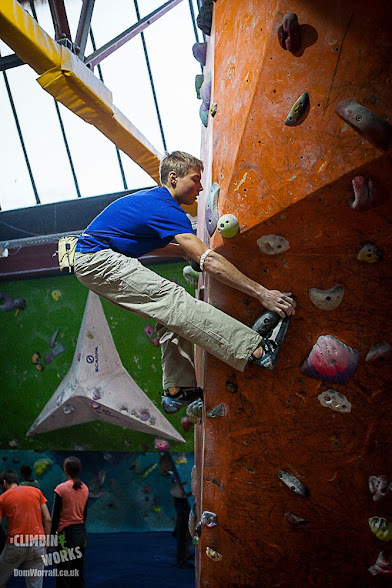 Sam Schofield is a Sheffield-based rock climber and writer. Check out his blog here.